The Yatra SMART choice property comes with a promise of 8 assured amenities, money-back guarantee and priority helpline support. You also get free cancellation and standardized prices through the year.Treebo Trend Oyster Suites is located at a distance of 9 km from Birla Mandir and 11 km Hyderabad Deccan Railway Station. This hotel in Hyderabad offers free Wi-Fi access to its guests.It comprises of 23 well-kept and spacious rooms with well-equipped amenities like air-conditioner, wardrobe, desk, telephone, LCD TV and makeup mirror. 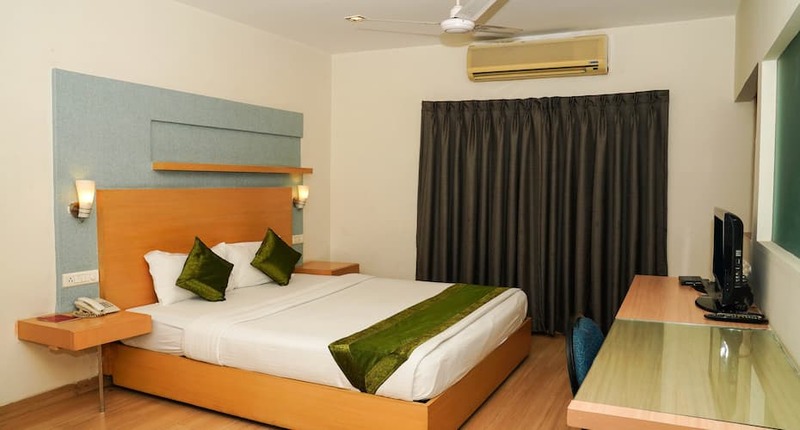 It has a separate sitting area and an attached bathroom with hot and cold running water facility.This hotel in Hyderabad has travel desk, conference room and power backup generator. This property offers laundry, medical assistance, 24-hour front desk and room service.Treebo Trend Oyster Suites has a restaurant within the premises. This property is 37 km from Rajiv Gandhi International Airport and 14 km from Jubilee Bus Station. Some of the tourist attractions are Taj Falaknuma Palace (27 km) and Salar Jung Museum (15 km). Reason For Rating : Clean room, staff very polite, food good. We went there as a group in March. In a side lane of Madhapur area. Location wise quite central. Rooms are good size but the towels , toiletries and sheets etc were just average. No restaurant as of now- is under renovation. Service was average. Just stayed for night ! Styed in this hotel which was great experience. Excellent ambience, Very neat and clean, lot of comfort. They are also providing mini kitchen with Oven, Induction, etc to prepare your food yourselves and mostly its helpful for the parents who has small kids/baby to take care of there food. They also have free breakfast which is quite ok not bad but not that much great.... I would like to visit again!!! Good Hotel / service apartments which suites your budget, staff were good and helpful, though food service is late but the taste is good. breakfast we have lot of varieties which is served as complimentary. I stayed in the suite room. It was quite comfortable. The staff is courteous and helpful. Though it is a small hotel, overall upkeep of the suite room was good. It was spacious and clean. There are limited choices for dinner, breakfast etc. On one of the nights, some construction work was going on, on the premises next door and it was very noisy. I had stayed in this hotel three years back also. But it had really improved since then. Keep improving! There are larger rooms on the upper floors. The lift was very good and useful. It is not a very large establishment so it always felt like a holiday house. There are some good coffee shops nearby and the State Gallery and a large hotel in walking distance. If you are traveling with small children and love home cooked meals once in a while, then Oyster Suites with its studio rooms,is the place for you!